In Haven by Mary Lindsey Rain Ryland has spent years living in shelters and the street. People have judged him because of his background, his size and his mom. She has many issues but it is mostly that she is a drug addict and this forces them on the streets. He is alone now and finds himself sent to a new town New Wurzburg, to live with an aunt he never met, never even knew of because his mother has died. But while that is hard on him, he now has a home to go too. Soon after being there he realizes things are normal, something is wrong but he doesn’t know what. He meets Freddie but he is told that she is bad news, yet he is pulled in and feels a connection. Even Freddie tells him to stay away, he will over his dead body, because for the first time in his life he has something to fight for, something to protect, something to call his. 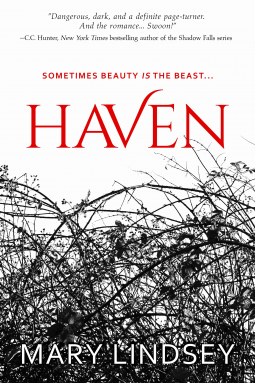 Haven is my first paranormal/shifter/werewolf/weavers/romance read, it is also YA and told by Rain’s POV which I found to be refreshing and to be honest awesome. I have to admit that the characters were awesome, Freddie was tough as nails, she didn’t put up with anyone’s crap, she didn’t need anyone to come to her aid but Rain did and he wanted to protect her from the start. She knew what she wanted and she went for it, their chemistry was amazing and you felt everything they felt with every word I read. I am struggling with this review only because I do not want to give any spoilers, with the cover and the blurb then you read the book and it is so exciting. I couldn’t put it down, every chance I had I opened my kindle to get to the next page to see what happened. You never knew who the bad guy was and I always feel I know. One thing I will say while this is YA, it is told in the male POV and there are some very intense and hot scenes so it is definitely mature read. Since I have never read YA Paranormal this was an extremely different read for me but it was different in the most amazing way. I cannot find one thing in this book that I would change, it was dark and it was amazing. There is an HEA and I felt at the end of the book all questions were answered and immediately wanted to re-read. Obviously this will definitely be on my re-read list and I will now open my horizon’s into this world and I hope all area as wonderful as Haven was.. I highly recommend Haven and I hope you loved it as much as I did.